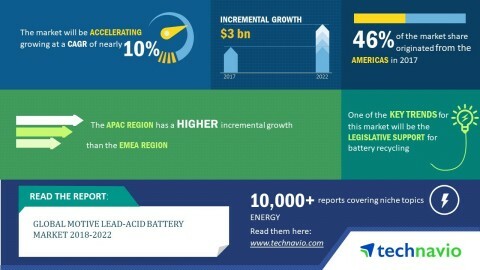 LONDON--(BUSINESS WIRE)--The global motive lead-acid battery market is expected to post a CAGR of nearly 10% during the period 2018-2022, according to the latest market research report by Technavio. This market research report on the global motive lead-acid battery market 2018-2022 also provides an analysis of the most important trends expected to impact the market outlook during the forecast period. The European Union has strict legislation for alkaline batteries. The EU Directive 2006/66/EC on batteries, issued on September 26, 2006, requires all states to reach a collection rate of 45% by September 2016, which corresponds to over 120,000 metric tons. It also specifies that half of the battery's weight received for recycling must be converted to post-consumer form. All battery manufacturers are obliged to meet the regulated recycling levels. The global motive lead-acid battery market is set to post a CAGR of nearly 10% during the period 2018-2022, according to Technavio.